At Sleep Boutique, we have a simple process for ensuring you get the very best mattress to suit your needs. Assess – This is where we find out what you need! It’s easiest to come into the store and visit us so we can chat with you, but if that’s not possible, we’d love for you to call us. This way we can ask you questions about your sleep positions, and any pain, aches or sleep issues you’re dealing with. Design – We help you understand how the structure and materials of the mattress will best address your sleep habits, and suggest options at different price points for you. The following is an overview. Inner Structure: Get the exact amount of support you need by choosing from various types of Foam, Full Coil, Pocket Coil, or Components – in any size: single, double, queen, small baby cribs, to irregular RV mattresses, to oversize Alaskan (aka California) King or any custom size in between! Top Layer Materials: Find the sponginess and warmth level you prefer by choosing from Talalay Latex, Dunlop Latex, JOMA Wool, CHI Memory Foam, and a variety of other natural or synthetic foams. Exterior Fabrics: Choose a texture that is soft, silky or all natural, using fabrics such as Bamboo/Rayon, Cotton, Organic Cotton and more. We can also offer waterproof, wipeable and vinyl options. 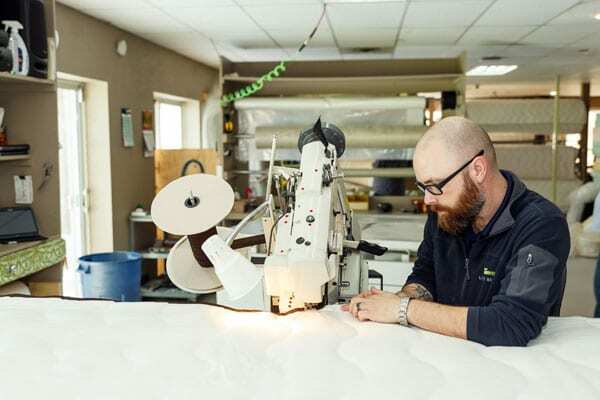 Build – We construct your mattress to your exact specifications right in our shop in Calgary. We can deliver anywhere in North America. If you are ordering a component mattress with interchangeable pieces, we’ll give you easy instructions to assemble it (no tools required). How long does it take to get my mattress? Our custom mattresses take 2 – 3 weeks to build, and 1 – 7 days to ship, depending on your location. We will include or specify the delivery costs on your quote, unless you specifically would prefer to pick up your mattress.